Looking to upgrade your kitchen with a new design? Before you call your local contractor you want to be certain you’re putting in place improvements that will increase the resale value of your home. Realtors, builders, and market aficionados agree the essential components to a kitchen include appliances, wall color, countertops, and cabinets. These necessities should be the elements to focus on in a remodel. Appliances are the most used devices and technological comforts in a kitchen, becoming an extension of a home chef. Modern appliances, just like the latest mobile device, often attract more buyers. Stainless steel is a popular choice for appliances because of the ease in cleaning. Dated and worn appliances might cause a buyer to question the age and maintained condition of your house, so keeping sharp technology is never a bad idea. 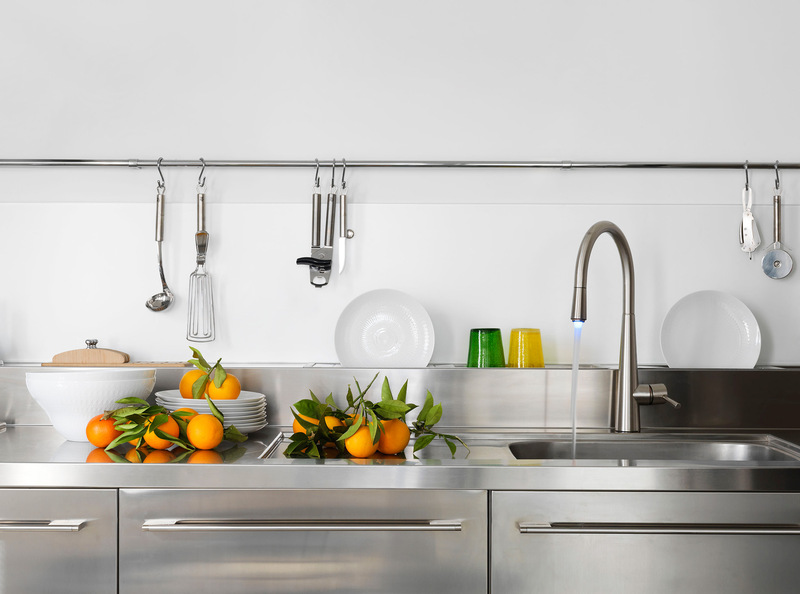 What’s more stainless steel offers a clean, versatile look that will match just about any décor. Speaking of clean and sharp, color is also important in giving off a good impression to potential buyers. A fresh paint job can be one of the most inexpensive ways to give a totally new feel to a space. Right now, neutral colors such as whites and grays are en vogue, particularly because of their clean feel and versatility to a wide range of styles. White can energize a room while allowing you to play around with warm or bright accents and backsplashes. Dark colors aren’t bad necessarily, but are certainly not as popular because they tend to feel too intense and overpowering. White offers endless potential and that is what buyers are looking for. Countertops also come in a plethora of styles and colors, and the most popular material is granite. Granite can capture the sophistication of marble without its costly price and maintenance, making it a smart choice for buyers and sellers alike. It also functions as a superb food prep surface, withstanding even the sharpest knife blades and most acidic produce. Even better, this stone requires little to no maintenance (takes only soap and water to clean) and will almost certainly outlast the life of you and your home. If you already have granite countertops, or are operating on a smaller budget, you can restyle a kitchen through a simpler project while still increasing the value of the space. Consider a cabinet resurfacing. Cabinets cover a large surface area in a kitchen, so they provide an easy design change for a kitchen without gutting the entire place. Flat panel cabinets are currently most in style, offering a sleek and modern look and feel. A cabinet refacing is cost effective because it is about half of what a full gutting and replacing will run you. If your current cabinets are made of quality material, consider making a style change by merely replacing the “cabinet jewelry,” the handles and hardware on the cabinets. This is another cost effective strategy (hardware replacement runs under $200) that can make your space look brand new. In the Chicago real estate market, for example, the median sale price in 2015 was approximately $240,000. Experts suggest that the cost of an ROI improvement project should fall between 5 and 10 percent of the assessed home value. But you can get more with less so long as you consider these ways to stretch your dollar when making informed decisions to improve the value of your home. Remember to always let form follow function. Built-ins such as a lazy Susan or wine rack are very expensive, rarely utilized, and don’t offer much added value according to builders and real estate agents. With this new expert knowledge under your belt, you now have all the tools to up your selling price and lesson the time your home is on the market! About the Author: Steve Constable is the owner of Chicago Kitchen Remodeling Inc. and has a bachelor of arts degree from Indiana University Bloomington. He is an expert in home design and remodeling and strives to incorporate green building practices into his work.